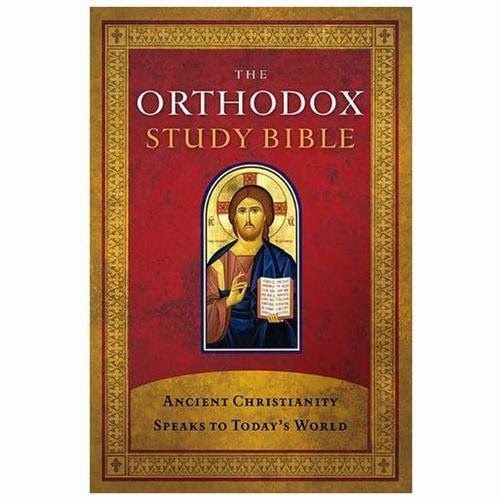 I appreciate the great labor that went into producing The Orthodox Study Bible (OSB). Father Jack Norman Sparks was the principle overseer of the project. He was the Founder and Dean of St. Athanasius Academy of Orthodox Theology (Antiochian) in Elk Grove, California. The Project Director was Father Peter Gillquist. Both of these remarkable scholar-priests are now at repose. Memory eternal! Mr. Sam Moore, the retired chairman of Thomas Nelson Inc; established a matching gift program to fund the project. Mr. Moore once commented to Father Gillquist that since the Protestants and the Catholics had their study bibles, why shouldn't the Orthodox have their own study bible? This challenged Father Gillquist, whose efforts, along with many others, culminated in the completion of the first Orthodox bible (New Testament and Psalms) in 1993, and the publication of the current Orthodox bible in 2008. The current edition includes the Old Testament, Wisdom of Sirach, Prayer of Manasseh, 1 and 2 Esdras, Susanna, Bel and the Serpent, and the Hymn of the Three Young Men. The Orthodox Church uses the 49 books of the Greek version of the Old Testament called the Septuagint (LXX). It was produced in the third century B.C. by seventy Jewish scholars who gathered in Alexandria, and it became the universally accepted version of the Old Testament. A strength of the Orthodox Study Bible is its attention to the doctrinal consensus of the Seven Ecumenical Councils. The notes give primary attention to the Doctrine of the Holy Trinity, The Incarnation, the centrality of the Church as the "dwelling place of God in the Spirit (Eph. 2:22), and the Virtues whereby God's people live righteous lives. Another strength of the Orthodox Study Bible is the inclusion of interpretation of "the fathers of the ancient and undivided church." Doubtless this was one of the contributions of Fr. Jack Sparks who edited The Apostolic Fathers (Light and Life Publishers). Some Orthodoxy regard the apostolic fathers in a similar way. Yet, one must wonder if the fathers would want us to give their words the same spiritual weight at the Scriptures upon which they meditated? They understood how human counsel, even that of the spiritually enlightened, can err. They engaged in refuting rabbinic interpretations that obfuscated the Gospel. Judaism has its bible, the Tanakh, which is explained by the Talmud, the authoritative collection of writings drawn from the tradition of the Jewish people. Today, Orthodoxy has their study bible. There are inaccuracies in the notes on Genesis and this constitutes one of the deficiencies of the publication that I hope will be corrected in the future. Here are some corrections that would improve the Orthodox Study Bible notes on Genesis. 3:15 - The Orthodox Study Bible recognizes that this verse about the Woman's seed speaks of Christ, yet there is no mention of the Blessed Virgin Mary as the Woman, and there is no reference to Jesus' self-description as the Seed in John 12:24. 4:16 - Nod is a play on the word Nok. In Hebrew, these words are almost identical. Nod means to wander and the people of Nok were known to wander with their cattle. These were Abraham's Nilo-Saharan ancestors. 4:25 - Here the Orthodox Study Bible contradicts what the Bible reveals about the intermarriage of the lines of Cain and Seth. It states that Christ is a descendant of Seth only. However, analysis of the Genesis 4 and 5 king lists makes it clear that these lines intermarried. Therefore Abraham, Moses, Samuel, David and Jesus are descendants of both Cain and Seth. 5:3 - The OSB identifies Seth, Adam and Eve as a type of the Trinity. In this view, Seth is a type of Christ. However, this fails to take into account that Cain is the kingdom builder, not Seth. In fact, throughout the Bible Cain is identified with the office of king. Genesis 4:7 states that Cain would rule over Seth. In Jude's epistle (c. 68 AD) Cain is cast as the archetype of the earthly ruler. Jude warns those who might abandon Christ because of their suffering and false teachers that God punishes those who rebel against Him. He uses three men as examples: Cain the ruler, Balaam the prophet, and Korah the priest. These were the three most sacred offices among Abraham’s people and they were often filled by people corrupted by the world. We have no Biblical evidence that Cain repented of his brother's murder, but there is much biblical evidence that God showed him mercy just as he did to the murderers Moses and David. He deserved to die, yet God protected him from those who might kill him. God allowed him to become a ruler, to build a city, and to be one of the ancestors of Christ our God. Instead, the OSB should have noted that Genesis hints at the Trinity in Genesis 3:15. The Woman (not Eve, as she is not named until Genesis 3:20) is to conceive and bring forth the Seed of God. She conceives by God through the Holy Spirit and brings forth the Son of God. Here we have Father, Son and Holy Spirit. Abraham's people believed that this was to happen by divine "overshadowing" (cf. Luke 1:26-28). This is an aspect of the solar symbolism of the ancient Habiru/Hebrews. 11:10-31 - The OSB states, "The genealogy of Shem carries Christ's genealogy down to Abraham..." (p. 16). However, Abraham was a descendant of both Shem and Ham since the Scriptures make it clear that their lines intermarried. I've never read any speculation on the reasons why the Bible seems so obsessed with birth lines. Or should we accept it as a Divine mystery? The Bible traces the line of descent of the Messiah because this is a critical factor in identifying the true Messiah, who is Jesus, born of Mary, daughter of the ruler-priest Yoachim, of the Horite line of Matthew (Mattai/Mattan) and a descendant of the prophet Nathan. Two questions: [first:] Who do you think Lamech killed? St. John Chrysostom's insights on these verses (to the effect that the interpolation of a female name in the ancestral list, Naamah, being somehow significant, and somehow revealing of some hidden grace), together with the proliferation of the number 7 -- do strike me as wonderful, but incomplete. If these insights belong in the OSB (and if I had a vote on it, they would)-- wouldn't we still want to know: to what effect has this grace been poured out? Are we supposed to know something more precisely from the context, and from these clues, who Lamech killed? I have heard the following suggestions: (i) his father, Methusael (Lamech's sin now being worse than Cain's because it would be a parricide); (ii) his own son (an unnamed son, possibly another son of Zillah); (iii) his brother (thus making Lamech's sin equal in gravity to Cain's sin, but more heinous because more malicious); (iv) a stranger, an innocent by-stander. -- Your opinion?? [second:] How sure are you that the antecedents to Gen. 7:7 are meant to be understood in reference to "Abel" (and concretely, to Abel's descedents) rather than "sin" (figuratively) ("Unto thee shall be 'his' (sin's? Abel's) desire, and thou shalt rule over 'him' (Abel? sin?)")? Hi, Jonathan. These are good questions and things I've wondered about also. The Bible does not give information about who Lamech the Elder killed, only that Lamech believed he was justified in killing him. Naamah is the only woman named int eh Gen. 4 and 5 king lists and this is significant, as St.John recognized. Analysis of the kinship pattern revels that she is one of the bridges between the lines of Cain and Seth. Because of her, we are able to determine that these lines intermarried and that the cousin bride named her first born son after her father. This cousin bride's naming prerogative makes it possible to trace Jesus's ancestry back to Cain and Seth. One of Naamah's descendants was a kinsman of Job. Zophar the "Naamathite" was a descendant of Naamah, the daughter of Lamech the Elder (Gen. 4:22). So her line is attached to the righteous Job. I don't understand your second question. Could you rephrase it, please? As far as we know Abel had no descendants. That is why he is a type of Jesus Christ. Both were without children and yet they have many in their family of faith. Are you speaking about Cain's brother Seth who did have descendants - listed in Gen. 5? Oops. I meant Gen 4:7. -- where it says "... and thou shalt rule over him." You wrote in your post that "Genesis 4:7 states that Cain would rule over Seth" ... which surprised me, because, well, it doesn't state quite that; rather it seems you are making your own inference that 'thou' refers to Cain (and his descendents) -- a fair inference BTW --, and 'him' means "your brother" (and his descendents), i.e. Abel and his descedents. Or, I had assumed you meant Abel, because at the time of Cain's getting admonition from the LORD, the murder of Abel hadn't happened yet, and Seth hadn't been born yet (... or had he?). But you said "Seth". How sure are you, and why? The usual translations (and Church Fathers) leave us with a completely different idea: that the LORD is admonishing Cain in reference to the encroaching "sin" that better be mastered by Cain before the calamity comes to pass, as in this Gen 4:7 translation: "[the LORD says,] Sin is crouching at the door. It desires to dominate you, but you must subdue it." (NET). This has a parallel in Genesis 9:25-27, though this is likely from a later source which intends to elevate the lineage of Shem above the lineages of Ham and Japheth and their kinsmen living in Canaan. I find Dr. Collis's desire for an "Orthodox Talmud" misguided. It is in line with the popular misappropriation of Neopatristic theology, which reads the Fathers by harmonizing them so as to validate biases currently popular in Orthodoxy. The Jewish Talmud came from Pharisaical Judaism. For Christians, pharisaism is a temptation to be avoided, not embraced. There is no place for a Talmud in Christianity. We should let the Fathers challenge us instead of taming and caging them in an official Talmud. The Babylonian and Yerusalem Talmuds contain conflicting rabbinic views. As with the Church Fathers, there often is not consensus of interpretation on a given passage. However, the Talmud teaches its readers to place greater weight on it than on the Tanach. For Christians, the Church Fathers are an authority, but never equal to the authority of the written Word. Many of the later rabbis were aligned with the Sadducees. These were the pragmatists of the day who wanted to avoid trouble with Rome by suppressing Messianism. They rejected the hope of body resurrection held by their Horim because that was the key sign by which the Righteous Ruler would be identified.